Why You Should Become a Tourism Ambassador? When someone says tourism ambassador, often what comes to mind are the Abang-None of Jakarta, the Cak-Ning of Surabaya, the Denok-Kenang of Semarang, the Dimas-Diajeng of Yogyakarta, or the Mojang-Jajaka of Bandung. Maybe so, but the term itself remains vague. How exactly would you define tourism ambassadors? A more cynical way, people may look at a couple of tourism ambassadors as mere beauty pageant winners of things like Puteri Indonesia and Miss Indonesia. Those who become “youth stars” due to their 3Bs: brain, beauty and behavior. Some of you probably undermine these ambassadors; maybe they seem to do nothing other than appearing beside government officials during events. Few people regard them as an inspiring example to their peers and juniors. Whatever you think, tourism ambassadors are in your surroundings. They are usually high achievers both at academic and non-academic field. They are proud to make a difference, standing out above the crowd. They have strong passion to help government in preserving cultural heritage and promote tourism potential to the world. A group of young generation who are not only updating social media status or complaining public policies; but also striving for solutions. 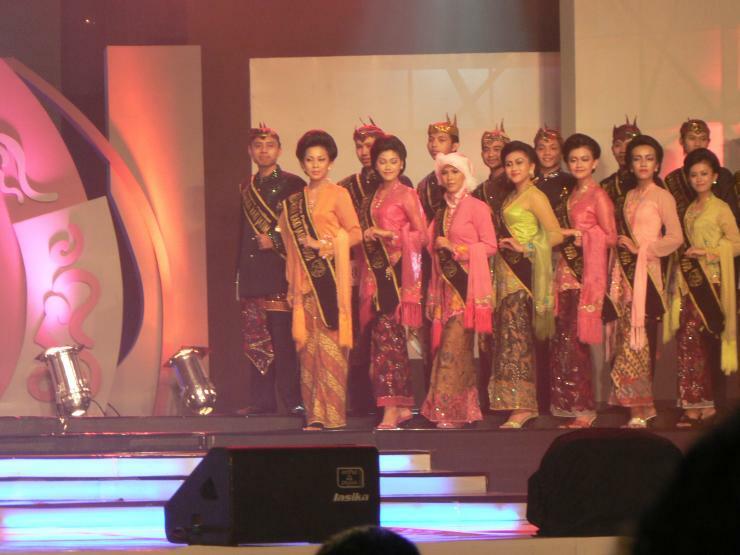 For example, the Magetan Tourism Ambassadors Association (IBADY) in my hometown who successfully made tourism promotion digitized, the Jakarta Tourism Ambassadors Association (IANTA) pioneered Betawi cultural preservation with his Teater Abnon, or the Mojokerto Tourism Ambassadors Association (IGY) which well-known in lots of cultural parades, included Batik. So, what is a tourism ambassador? To date, there is no widely accepted common definition. But, we can trace to the history of Abang-None in our capital city of Jakarta. According to my own finding, since 1968 the Provincial Government of Jakarta originally organized a contest aiming to select a “Miss Jakarta” as partners in promoting tourism and culture. The event was held in the country’s oldest shopping center Sarinah as part of the city’s 441st anniversary celebration. Three years later, the government officially organized the first annual Tourism Ambassador Contest “Abang-None”. As the popularity rose, other provincial capital cities such as Bandung and Surabaya followed. Today, the Annual Tourism Ambassador Contest is held across this country. Each municipality or district government would select couples of tourism ambassadors (Mr and Ms) annually with locally-customized name, for instance, Agam-Inong in Banda Aceh, Daeng-Dara in Makassar, and Jegeg-Bagus in Bali. The winners at municipality level can represent their hometown at a higher level, from provincial to the national stage. Hence, why do I recommend the young generation to become tourism ambassadors? Here are some benefits that you can get, from me and my peers’ perspective. Firstly, strengthening your network. In today’s tougher job market, networking is what can make you more valuable. By joining the so-called “Ambassadors Circle”, you have better access to key people across many industries. From policy makers, businessmen, media troops, social activists, entertainers, tourism practitioner’s preservers, cultural heritage or other change agents. Shortly, you are automatically connected to crème de la crème. For those who have curiosity, learn the career journey of tourism ambassador alumni. In Jakarta, Abang-None graduates are scattered in all walks of life. In the public sector, looks at Sylviana Murni, formerly the mayor of Central Jakarta and now a candidate for vice-governor. She smartly used her social capital as None of Jakarta to leverage her brand. Many of the media and entertainment industry, such as Maudy Koesnaedi, Ferdi Hasan, Alya Rohali, Shahnaz Haque, Tommy Tjokro, Indra Bekti, and Fifi Aleyda Yahya, were also tourism ambassadors. Those from other cities have also gone on to successful careers, for example Dora Multasari (Padang), Hatna Narada (Ponorogo), Dian Ekawaty (Makassar), Fessy Alwi (Surabaya), Tina Talisa (Bandung), Puteri Raemawasti (Blitar), Hijrah Saputra (Sabang) and Stebby Julionatan (Probolinggo). Secondly, upgrading soft skills. If you make the final round, you will undergo lots of training in hospitality, table manner, public speaking, character building, beauty class, creative marketing, arts & culture and many more. These day, we cannot just rely on hard skills if we want to succeed; soft skills are equally important. We can learn the career journey from tourism ambassadors-turned-politicians such as Zumi Zola (Governor of Jambi), Airin Rachmi Diany (Mayor of South Tangerang), and Venna Melinda (Indonesian Parliament Member). I personally witnessed the career journeys of my peers in East Java’s Raka-Raki Tourism Ambassador Contest in 2008. During the contest, most of us were still senior high school or university students. Today, they have become “diamonds” in many fields such as news presenter in national private television station, diplomat, lecturer, artist, flight attendant, entrepreneur, and notable writers. Thirdly, being public relations officers for the nation. As tourism ambassadors, we are asked to help the government in promoting tourism and cultural potentials by participating in various programs. Thus, we have experienced what it’s like to support government events from local to the international stage. Moreover, in the community level, we receive support to run our own projects under the Tourism Ambassador Association; it’s a great platform to enhance your knowledge, build leadership and management skills, and develop yourself. We have many opportunities to connect with bright and high-achieving peers from Sabang to Merauke. We learn from each other and witness the richness and diversity of our country’s cultural heritage. In short, the government trusts us as agents of change to create more and more ambassadors and promote what Indonesia has. In conclusion, becoming a tourism ambassador is a life-changing experience. It is where you gain a professional network, opportunities for your own personal development, and better knowledge of your country. I am not saying that tourism ambassador experiences can guarantee and make your dreams come true in a shorter way. I only believe that it makes you grow and give you the best opportunity to succeed our Ministry of Tourism’s branding campaign: Wonderful Indonesia.